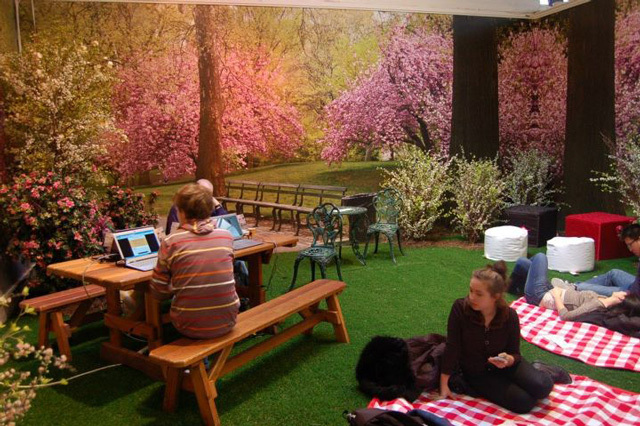 Welcome to New York City in winter, with a cure for cold-weather blues: a pop-up indoor park in lower Manhattan that’s open through Valentine’s Day. Despite temperate temperatures so far this year, “it’s our rebellion against winter,” says Jonathan Daou, founder and CEO of Openhouse Gallery, a company that holds a 20-year lease on the space at 201 Mulberry St.
On a recent chilly weekday afternoon, babies played barefoot in the 75-degree world of Park Here while their mothers and fathers sipped tea, eating cookies and sandwiches. One night, a movie is planned on the lawn; other days bring a ping pong competition, a trivia contest, wine tastings and soccer workshops. The 5,000-square-foot artificial habitat in the downtown Nolita neighborhood is filled with trees, rocks, picnic benches and the recorded ambient sounds of Central Park in spring. There are giant cushions and even a hammock, plus a baby elephant. But the park will be gone by mid-February. The rest of the year, the 200-year-old former police precinct is a stage for business that plays on the “pop-up” retail method mushrooming around the world in recent years: a quick presentation of a product, performance or personality, with no commitment to a lease or contract. It’s usually set up in a mobile unit that can be assembled and disappear. The space was part of a police precinct in the late 1890s under New York Police Commissioner Theodore Roosevelt, who later became U.S. president. But there’s nothing historic about what’s going on inside. On the contrary, it’s all the rage in retail. What a nice way to slough off that winter feeling and take a break and add some fun to your day. What is happening in your area that reminds you of spring?